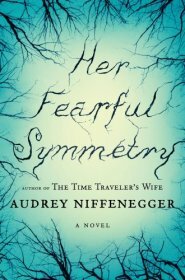 Audrey Niffenegger is an artist in creating lively, believable characters that are easy to understand, and sometimes identify with. But -- at least based on her first two novels -- she enjoys putting these characters in awkward, unnatural situations. In The Time Traveler’s Wife, the protagonist is “chrono-displaced”; in other words, he travels, involuntarily, through time. In Her Fearful Symmetry, one of the characters is, well, dead. Actually, Elspeth Noblin is alive when the novel begins. She’s ill and dying. In her will, she leaves her worldly possessions, including a flat in London and a substantial amount of money, to her twin nieces, Julia and Valentina. Per the conditions in Elspeth’s will, the twins are forced to leave their parents in Chicago and move to the flat in London. Apparently, Elspeth doesn't really like her identical twin sister, Edwina (Edie) Noblin Poole, the mother of Julia and Valentina, and yanking the younger twins from Edie is perhaps a vengeful move on her side. So Elspeth’s death is natural enough, and an important plot device. But in an interview, Niffenegger explained that she had a hard time parting with Elspeth. Where some authors would have resorted to flashbacks, Niffenegger’s solution is turning the book into a ghost story. What dark secret estranged Elspeth and Edie? How similar are the younger twins to the older ones? Physically, they’re very similar -- to each other, and to their mother and aunt. One difference is that, rather than being identical, they are symmetrical twins, each a mirror-image of the other, to the extent that Valentina’s heart is on her right, causing her various medical issues. Like E&E, Valentina and Julia are also very close to each other, going throughout life hand-in-hand. Will it end as badly as it did for the elder twins? Hard to tell, at least before we learn what went wrong there. At some stage, Valentina decides to break free from the grip of Julia, which turns out to be the more dominant of the two. But rather than just announce a departure, Valentina chooses to flirt with death, Romeo-and-Juliet style (or should I say, Robert-and-Julia?). I suppose that when you share a flat with a ghost, and know for a fact that there’s life after death, risking your life seems somewhat less scary. But it is from this point in the plot that everything goes awry: the key characters are no longer believable, their actions no longer seem realistic (or even make sense), and the general feeling is awkward at best. It’s a pity, because such a well-created setup should have yielded a much better novel than what we actually have here.